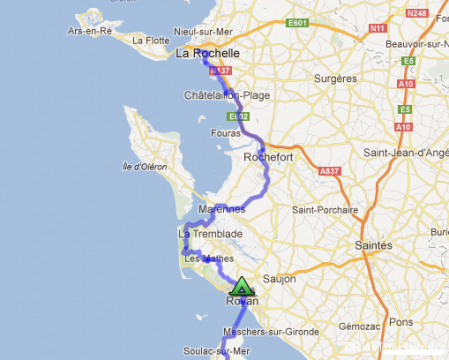 Saturday 20th April 2013 – From La Rochelle to Royan. We are leaving La Rochelle. “Good bye, see you next week!” Damien’s parents keep following us until a turn takes us away from their eyes. Ours are towards Toulouse. 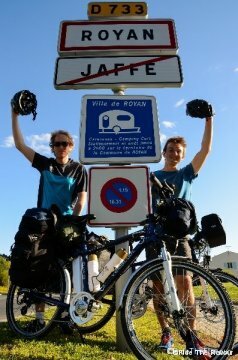 Our bikes carry everything we need, we are free, let our journey begin! We start riding towards Rochefort, on a road we know pretty well since we have already it taken during smaller trips. We stop at Chatélaillon to see a friend of ours, Jean-Pierre GUELOU. We find him in his pharmacy, preparing his precious remedies, and introduces him to our shiny Veloscoot bikes. A picture to mark this instant and to thank him for his support: Jean-Pierre will give us the first aid kit that we will carry all around the world! 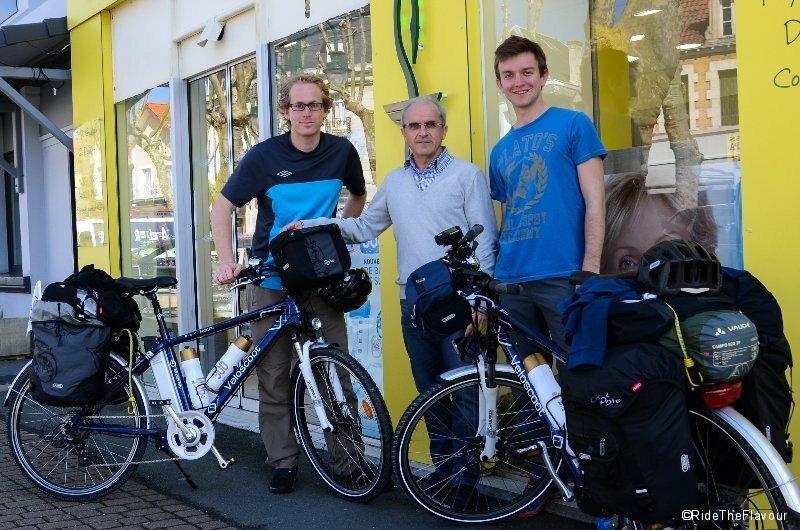 At 7 pm, we set foot on the ground near Royan, in a housing estate. Anything particular about it? We did not stop there for the nice houses but rather for the forest that surround them. We will be able to set our tent and bivouac there easily. 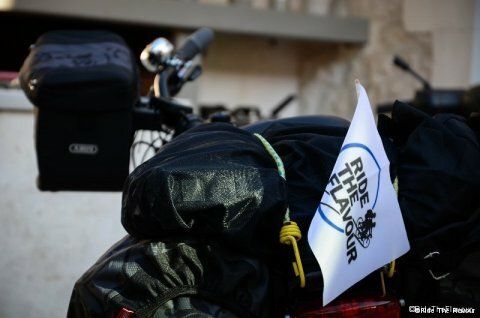 But first, we have to find someone, a generous psoul, who will accept to recharge the batteries of our bikes during the night. A woman is in her garden, looking after her car. We ask her and, after we have explained our situation, she accepts to host our batteries for the night. “But, I cannot invite you for a drink though, I have many things left to do.” No embarassment, she already invites our batteries for a charge! We thank her and then enter the forest. 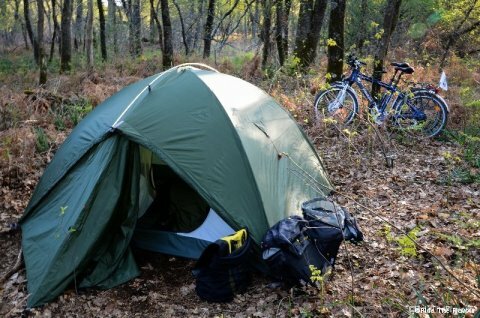 We find a flat space, big enough for our tent, and start setting our bivouac. Crap, we forgot to refill our flask! Back to the housing estate, we meet a girl, waiting for her friends to come (looks like there will be a hell of a party tonight), and ask her for water. She anwers with innocence: “tap water or bottled water?“. Tap water would be perfectly fine, thanks a lot! We need water to drink, but also to cook our (almost) gastronomic dinner: pasta served with their tuna and tomato sauce 😉 The forest is humid, and its mosquitos agressive. Whatever, we rode 100 km today and we do not use gas as fuel. We are hungry and even these useless and annoying insects cannot spoil our dinner! What about our electric bikes ? They are little gems! Several levels of assistance. 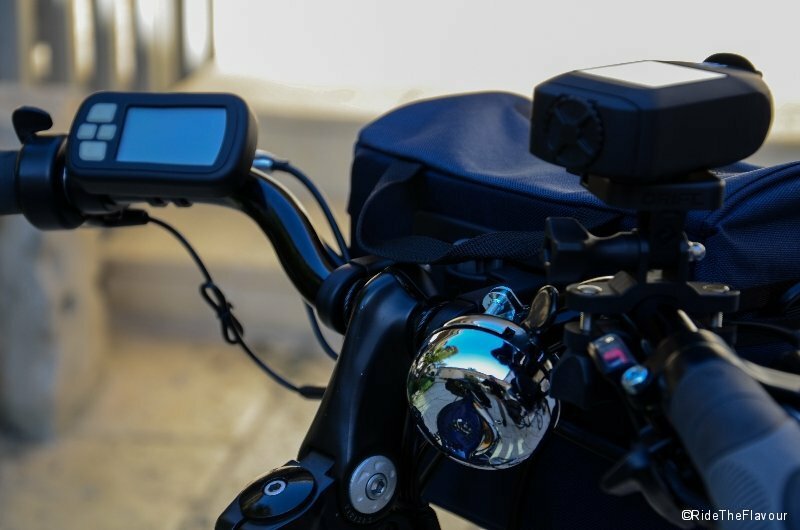 A manual mode with a trigger which allows to punctually activate and dose out the assistance (awesome when riding off road!). An easy-start which throw the bike up to 6 km/h without pedaling. And in spite of all this embedded technology, these bikes are really aggreable to ride, even if you shut down the electric assistance. During this first day, we rode without assistance as much as we could (we used it only when climbing), and here is the result: after 100 km, our batteries were 2/5 charged. And we were right: generosity and hospitality did not disappear from France! Our journey proved it… and we will prove it through the story of our journey! Thank you Erica, good to see that you are following us! vous aviez de la chance, il fasait beau sur toute la france la semaine dernière non ? Bonne continuation, j’attends 2ieme journnée ! Quel suspense ! Êtes vous bien arrivés à Toulouse ? Vous pouviez rouler à quelle vitesse moyenne avec l’assistance électrique ? Oui, nous sommes arrivés à Toulouse jeudi, après 6 jours sur les routes ! Nous sommes en train d’écrire notre journal et le publierons au fur et à mesure ! On peut rouler jusqu’à 25 km/h avec l’assistance électrique. Au delà, réglementation oblige, elle doit se couper. Sinon, le “véhicule” sort de la catégorie “vélo” et doit être immatriculé.